A comedian is not a person who opens a funny door — he's the person who opens a door funny. When the coyote falls, he gets up and brushes himself off; it's preservation of dignity. He's humiliated, and it worries him when he ends up looking like an accordion. A coyote isn't much, but it's better than being an accordion. Humiliation and indifference, these are conditions every one of us finds unbearable–this is why the Coyote when falling is more concerned with the audience's opinion of him than he is with the inevitable result of too much gravity. Nobody noticed us back then. Nobody called us geniuses. And we didn’t feel like artists. We were just trying to make people laugh. 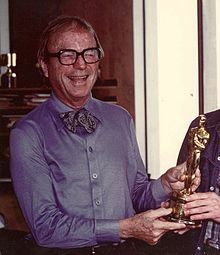 Charles Martin "Chuck" Jones (September 21, 1912 – February 22, 2002) was an American animator, cartoon artist, screenwriter, producer, and director of animated films, most memorably of Looney Tunes and Merrie Melodies shorts for the Warner Bros. Cartoons studio. John Lewell, "The Art of Chuck Jones: John Lewell Interviews the Veteran Hollywood Animator ," in Animation - Art and Industry, ed. Maureen Furniss (John Libby Publishing Ltd., 2009), 134. Jones was paraphrasing Ed Wynn who was in turn paraphrasing Fred Allen. As Norman McLaren said, animation is not a bunch of drawings that move — it's a bunch of drawings of movement. Lewell, "The Art of Chuck Jones", 137. John Lewell: Can you tell us: what exactly was Jack Warner like, as an employer? Chuck Jones: Well, what he was like was nothing! We had nothing to do with Jack Warner. After fifteen years of direction (and the other person present, Friz Ferleng, had directed longer than that) we were finally invited by him to have lunch in the executive dining room. This was reserved for executives and favorite directors. Jack Warner was there. And Harry Warner was there. Jack didn't say very much to us. He was talking to other people about other things. But Harry Warner said: "The only thing I know about our cartoon department is that we make Mickey Mouse." Well, that was a little startling. It was the early 1950s, for God's sake! And so when we left, I said: "Don't worry, Mr Warner, we'll continue to make good Mickey Mouses!" And he patted me on the back. Lewell, "The Art of Chuck Jones", 139. Joe Adamson, "Witty Birds and Well-Drawn Cats: An Interview with Chuck Jones ", in Chuck Jones: conversations, ed. Chuck Jones and Maureen Furniss (Univ. Press of Mississippi, 2005), 63. The best way, of course, to understand the animator is to see that he parallels the actor. He has the same responsibility a fine actor has. [...] Even the people who write about animation just don't seem to understand that when you have a drawing, you don't have a character. [...] "This is the first Bugs Bunny" has no meaning. It's how Bugs came to stand and move and act, and what his feelings were, and his thoughts, and what kind of personality he was. That developed over a period of time. And you need fine animators to do that. Adamson, "Witty Birds and Well-Drawn Cats", 61. Everything on Saturday morning [cartoons] moves alike—that's one of the reasons it's not animation. The drawings are different, but everybody acts the same way, their feet move the same way, and everybody runs the same way. It doesn't matter whether it's an alligator or a man or a baby or anything, they all move the same. Adamson, "Witty Birds and Well-Drawn Cats", 64. [W]hen the coyote falls, he gets up and brushes himself off; it's preservation of dignity. He's humiliated, and it worries him when he ends up looking like an accordion. A coyote isn't much, but it's better than being an accordion. Adamson, "Witty Birds and Well-Drawn Cats", 53. Chuck Jones, Stroke of Genius, A Collection of Paintings and Musings on Life, Love and Art (Linda Jones Enterprises, 2007), 78. The two most important people in animation are Winsor McCay and Walt Disney, and I'm not sure which should go first. quoted in Canemaker, John (2005). Winsor McCay: His Life and Art (Revised ed.). pg. 257. Abrams Books. I don’t mind people admiring me if they want to but I don’t think it’s very logical. It’s not like I was St. George knocking off some dumb dragon or anything like that. First of all, you’re talking about something I did a long, long time ago. Secondly, we were doing things that were not expected to last a lifetime. We figured they’d last about three years and then disappear forever. Remember there was no television back then and no place for the cartoons to go after they left the theaters. But I’m not trying to demean what we did. I always took the work very seriously and I’m proud to have been associated with the work we did. It’s just that adulation is impractical and makes me uncomfortable. Nobody noticed us back then. Nobody called us geniuses. And we didn’t feel like artists. We were just trying to make people laugh. ↑ Barry Popik (November 10, 2015). “A comic says funny things; a comedian says things funny”. Retrieved on January 7, 2017.